Five months after being diagnosed with stage IV Mesothelioma, the Lord welcomed Jim into the kingdom of Heaven. A Godly man, Jim stood firm in his faithfulness to the Lord Jesus Christ. Jim enjoyed serving in his local church and helping others. A beloved husband, father, and grandfather, Jim is survived by his wife of 43 years Carrine. Daughters Dena Bonner (Scott) and Shelly Morris (Myrick) and five grandchildren. Everyone is welcome to join the family for a public graveside memorial service to be held on Friday, Feb. 1 at 2:00 p.m. at the Sarasota National Cemetery, 9810 State Road 72, Sarasota, FL 34241. Heartfelt thanks to the Tampa VA Hospital and the Comfort Care Facility for their excellent care to Jim and the family. In lieu of flowers or other gifts, memorial donations in Jim’s name can be made to Jeremy and Katie B. (serving in Myanmar) at gracechurch.org/jeremyb or Grace Bible Church of Tampa – 10309 Raulerson Ranch Rd. Tampa, FL 33636. Paul Franklin Tindle, 92, of Plant City, passed away Dec. 30, 2018. Born in Plant City, he was the son of the late Clifford and Rosia Sanders Tindle. He was also preceded in death by his children, Phyllis Richards and Craig Trentham; siblings, Nita Miller, Iris Smallwood, Louise Jenkins, Jenelle Vaughn, Elizabeth Dean, Mickey Martindale and Mary Jo Rodgers. His survivors include his beloved wife of 28 years, Beverly Mills Tindle; children, James Tindle (Linda), Paul Tindle II; sister, Virginia Ruth Griffin; ten grandchildren, and twelve great grandchildren. Paul was a member at First Baptist Church of Plant City, a US Navy Corpsman/Medic, a three time city commissioner and mayor for Plant City, was a property appraiser for Hillsborough County for 19 years, an insurance agent with Gulf Life, a switchman and electrical contractor for Coastline Railroad, owned and farmed 52 acres across from the high school, was a member of Gideons, the American Legion and a Mason at Olin S. Wright Lodge. The family would like to thank the following who lovingly served Paul: Dr. A. John Saranko and staff, Dr. A.M. Hossain and staff, the staff of the infusion department at South Florida Baptist Hospital, and Seasons Hospice and staff. If desired donations may be made in Paul’s Memory to First Baptist Church of Plant City’s Building Fund. Online condolence may be left for the family at haught.care. Doris Smith, 83, of Plant City, born on March 16, 1935 in Athens, Alabama, entered into eternal rest on Jan. 23, 2019. Expressions of condolence at www.HopewellFuneral.com. Dorothy V. Cooper, 90, of Plant City, born in Lenox, Georgia on Nov. 7, 1928, went home to be with Jesus on Jan. 22, 2019. Marvin Ray Lucier, Sr. “Pepe”, 61, of Lithia, born in Tampa on June 18, 1957, entered into eternal rest on Jan. 21, 2019. Jane Ellen Hatton, 69 of Plant City passed away Jan. 21, 2019. Services were held Saturday, Jan. 26, 2019 at Haught Funeral Home, 708 W. Dr. MLK Jr. Blvd., Plant City. Online condolences may be left for the family at www.haught.care. Ronald E. Watson, 77, of Lithia, born in Tampa on April 16, 1941, entered into eternal rest on Jan. 19, 2019. 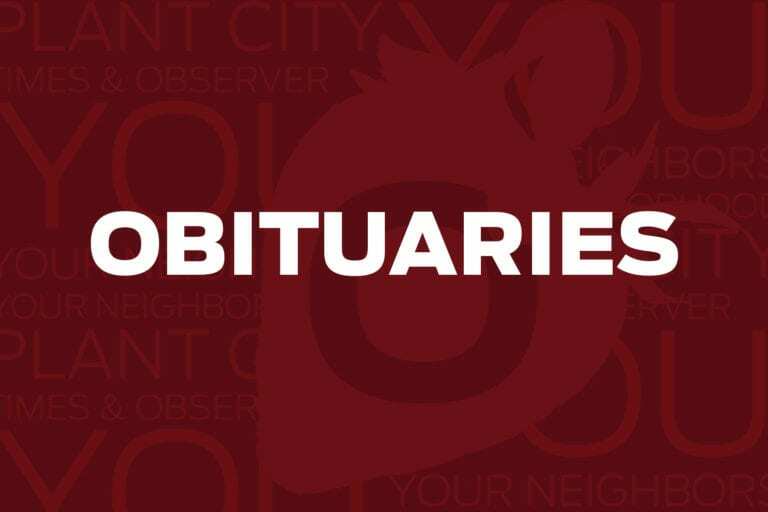 Carolyn E. Kitchens, 84, of Plant City, passed away on Jan. 21, 2019. The family will receive friends Saturday, Feb. 2, 2019 from 11:00 a.m. to 12:00 p.m. at Haught Funeral Home, 708 W. Dr. MLK Jr. Blvd., Plant City, FL 33563. Funeral services will follow at 12:00 p.m.
Geneva Worrell Carlton, 89, of Plant City, FL passed away on Jan. 25, 2019 in Lake City, FL. In lieu of flowers memorial contributions may be made to Florida Baptist Children’s Home, PO Box 8190, Lakeland, FL 33802.